Glass elevators are the confluence of style and practicality. 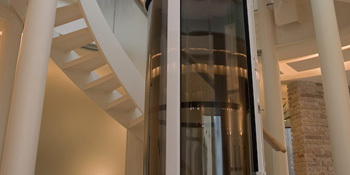 Vision elevators, particularly, are characterized by round, glass-like clear acrylic systems that, once the user is inside, offer a gorgeous panoramic view. While the system, in this regards, expands mobility and convenience inside a home, Vision glass elevators go even further. Blending in with decors of all looks and types, Vision elevators add wheelchair access to upper floors and open up independence and access to everyone. The versatile template for each Vision system is a clear hoistway and cab. This simple design provides several possibilities for expanding mobility into the home or a small commercial building. First, the elevator requires minimal installation and preparation. A machine room does not need to be set up, and pits and hoistways do not need to be created out of existing space. 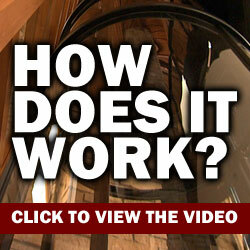 Instead, a Vision glass elevator attaches to a balcony or passes through a hole cut out of the floor. Glass elevators from Nationwide Lifts operate by either a pneumatic vacuum or cable-driven system. Air pressure creates the former's movement. The cab, which has a seal built into the ceiling, is lifted by air pressure created by turbines at the top of the hoistway. The turbines draw out air to move the cab upward and turn off to send it downward. Once the cab is at a floor, steel brakes safely secure it to the landing. Even with a similar visual look, cable elevators are equipped with a motor and drum unit at the top of the hoistway. Two cables are connected to a drum unit, which winds to raise the cab and spools out to lower it. A variable frequency drive powers the motor, which accurately and smoothly controls the operating speed. Straightforward installation, improved accessibility, and smooth operation are just some of the facets of Vision glass elevators. Each system varies in size and capacity. Smaller systems support from 350 to 525 pounds and are designed for residential uses only. 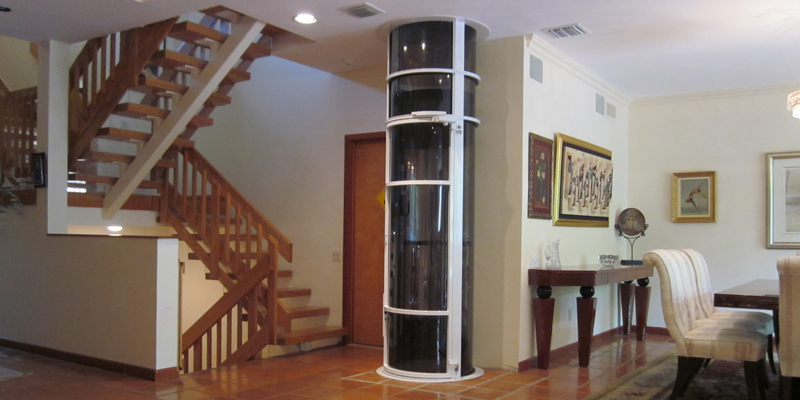 Larger glass elevators, built for both residential and commercial needs, move up to 830 pounds. All systems travel a total of two to five stops. For increasing wheelchair access in either a home or small commercial building, consider the Vision 550, the Visi-58R, and Visi-48S. All capable of supporting and transporting passengers with wheelchairs, these systems have diameters of 52, 58, and 48 inches, respectively. The Vision 550, however, is strictly a residential model. For adding the beauty and view of a glass elevator and all of the improved accessibility and conveniences, contact Nationwide Lifts today to discuss any of our innovative systems.